We are into vintage doors. We also customize doors as per the requirement. Vintage Architectural Carved Entrance Door front elevation. 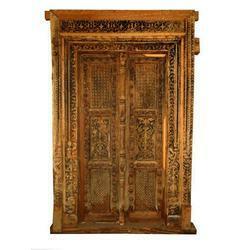 Exporter of antique Carved Jumbo size door with architectural frame. Carved elevation and front door in heritage look at the doorstep adds a beauty and elegance to theresidential and commercial sites. Fine hand craftsmanship from skilled artisans in front, exterior and architectural doors provide a feel of olden and golden era. with reference to the requirement of Commercial spaces, residential sites, we offer Architectural vintage reproduction styles. 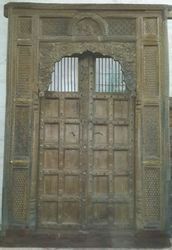 The Doorsare finally finished to antique look to maintain the attraction of the piece. 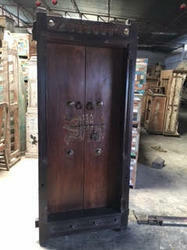 We also repurpose doors to antique furniture, old furniture, vintage furniture, antique furniture online, antique door furniture for sale, antic furniture, carved furniture, antique tables, chest furniture, mid century modern furniture, mid century furniture, sideboard furniture, buy antique furniture online, solid furniture, antique french furniture, antique style furniture, antique furniture designs, old antique furniture for sale, vintage style furniture, vintage furniture for sale, vintage looking furniture, furniture vintage, vintage furniture store, cheap antique furniture, antique industrial furniture, antique looking furniture, buy vintage furniture, old fashioned furniture. Antique Front door with carved frame, Occasional door, Exterior door. Caved exterior door at the doorstep in gujarati pattern adds a beauty and elegance to the residential and commercial sites. 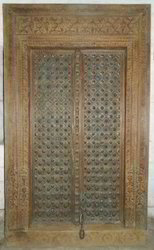 Pair of Antique wood door panel carved in Teak wood, Rosewood, Indian wood in traditional patterns. 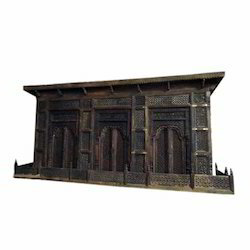 Antique INDIAN wood solid set Teakwood door carved panel (old), These items come from Indian furniture of old times and are taken our during redesigning old houses into modern ones. The defects of Old Age are always photographed and restored keeping them visible. 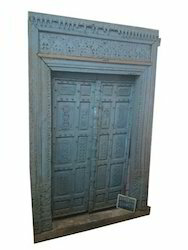 We also repurpose doors to antique furniture, old doors, vintage doors, antique doors online, antique carved door for sale, antic doors, carved doors, antique doors, chest furniture, mid century doors, mid century carved doors, Entrance doors, buy antique doors online, solid wood doors, antique french style doors, antique style furniture, antique door designs, old antique door for sale, vintage carved door, vintage doors for sale, vintage looking doors, doors vintage, vintage Entrance doors, cheap antique indian doors, antique brass fitted doors, antique carved door panels, buy vintage door sets, old fashioned doors. Antique look door at the entrance adds a beauty and elegance to the residential and commercial sites. Fine hand craftsmanship from skilled artisans, salvage doors, vintage front, exterior and architectural doors provide a feel of olden and golden era. Solid wood doors in vintage designs and patterns reflecting Indian heritage look provides an elegance to interiors. 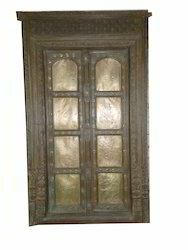 These solid wood door panels with carved border and brass fittings, some designs have carving on door panels etc. are made of old, reclaimed, salvage wood which is treated by nature over years. Vintage old Original Architectural Vintage Carved Brass Fitted Door. 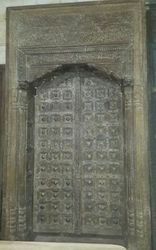 Antique Shekhwati Door With Carved Frame. Antique word refers to the old products that are replaced while the renovation of buildings in the modern times during urbanization. The Doors are salvage doors from relcamation yards. The are a class of fine hand craftsmanship. They are cleaned, restored and finished for the vintage theme decor people. salvage doors, vintage front, exterior and architectural doors provide a feel of olden and golden era. with reference to the requirement of Commercial spaces, residential sites, Architectural salvage vintage doors are offered in a wide range of designs. The Doors are finally finished to antique look to maintain the attraction of the piece. Antique look door at the doorstep adds a beauty and elegance to the residential and commercial sites. Fine hand craftsmanship from skilled artisans, salvage doors, vintage front, exterior and architectural doors provide a feel of olden and golden era. with reference to the requirement of Commercial spaces, residential sites, Architectural salvage vintage doors are offered in a wide range of designs. The Doors are finally finished to antique look to maintain the attraction of the piece. The word 'antique' here at website refers to the old doors that were replaced buy houses during the era of modernization and change in interior designing. Architectural Big Entrance Carved Door and front elevation. Wooden Carved front elevation and front door in heritage look at the doorstep with balconies and mehrab arches adds a beauty and elegance to the residential and commercial sites. Fine hand craftsmanship from skilled artisans in front, exterior and architectural doors provide a feel of olden and golden era. with reference to the requirement of Commercial spaces, residential sites, we offer Architectural vintage reproduction styles. The Doors are finally finished to antique look to maintain the attraction of the piece. Ways to Repurpose old doors, Repurposed door crafts is also an option available with us. Architectural door panels, vintage door, door sets, occasional decorative doors for interior designintricately carved door for residential and commercial spaces for theme decor. Old doors restored for decorations. Caved exterior door at the doorstep in gujarati pattern adds a beauty and elegance to the residential and commercial sites. Fine hand craftsmanship from skilled artisans, salvage doors, vintage front, exterior and architectural doors provide a feel of olden and golden era. with reference to the requirement of Commercial spaces, residential sites, Architectural salvage vintage doors are offered in a wide range of designs. The Doors are finally finished to antique look to maintain the attraction of the piece. By utilizing our years of experience, we introduce our esteemed clients with a qualitative assortment of Vintage Intricately Carved Front Door. The front doors are from old buildings and are taken in a way that the beauty remains within. Our offered front door is acknowledged for its attractive traditional design. With consistent focus on our quality, our company is engaged in offering a wide range of Architectural Carved Door. 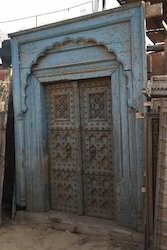 The provided door is acclaimed for its architectural & attractive royal design in the market. Offered door is manufactured by vendors highly skilled professionals using finest wood in accordance with the set norms. Our door is available in numerous specifications as per the need of clients. Being a well established-organization, we are engaged in exporting and supplying a distinguished range of Metal Vintage Door. The product are the original pieces and the strength of wood is enhanced by mother nature. In tune with different requirements of our copious clients, we customize the entire range in various sizes and shapes. 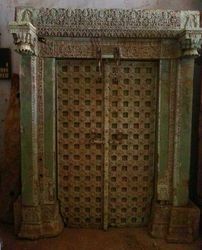 Vintage Architectural Carved Door with original hardwares are offered. 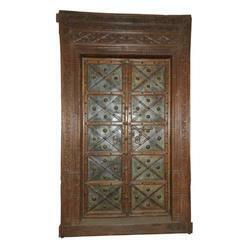 These antique doors are checked by our quality experts for assuring its flawlessness. 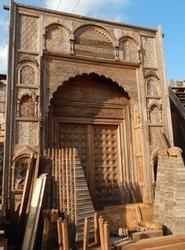 A huge collection of antqiue carved architectural door are avaialble to choose with us. For a list of avaialbility, feel free to contact. 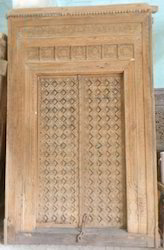 Being a well established-organization, we are engaged in exporting and supplying a distinguished range of Vintage wooden Carved Door with Metal fittings. The product are the original pieces and the strength of wood is enhanced by mother nature. In tune with different requirements of our copious clients, we customize the entire range in various sizes and shapes. Front Door, A Vintage, architectural, fine carved exterior door for heritage look to entrance. 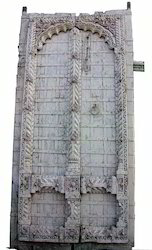 The door is restored to its provide sturdiness in the structure. ALPA CORP architectural carved doors, front door, exterior door,vintage door, One of a kind Hand Carved Doors With Metal Fittings, Pillar Columns, Hand Carved Wooden Ceilings, Parinda Door, Door With Metal Fittings, Wooden Architectural Accessories and much more are offered in a way to align with home decor ideas. architectural door panels, vintage door, door sets, occassional decorative doors for interiordesignintricately carved door for residential and commercial spaces for theme decor. For more details and variety feel free to contact. 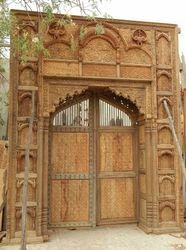 Vintage Carved Wooden Door, intricately carved frames. The Antique decorative wooden doors are the original pieces and the strength of wood in wooden doors is enhanced by mother nature. 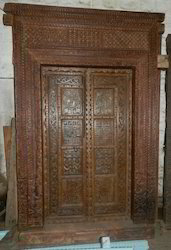 Antique wooden doors were intricately carved by skilled craftsman. These wooden doors are washed cleaned for home decor & interior purpose. In tune with different requirements of Vintage carved wooden doors from our copious clients, we customize the entire range of wooden doors in various sizes and shapes. A wide range of Wooden Doors to choose from Exterior Doors, Front doors, Architectural doors, occasional doors.Wooden Doors are with the original vintage hardware on them that enhances the beauty for vintage decor. 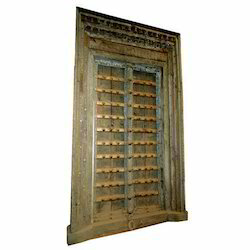 Doors with grills and dog gates are also offered for rustic theme decor interior style. 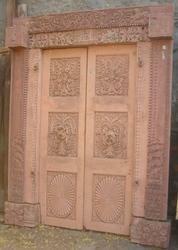 We offer a distinguished range of Carved Front Door. The product are the original pieces and the strength of wood is enhanced by mother nature. In tune with different requirements of our copious clients, we customize the entire range in various sizes and shapes. 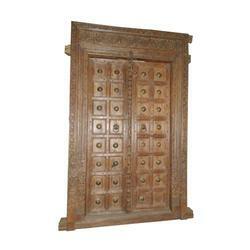 Architectural elements for furnishings from INDIA. 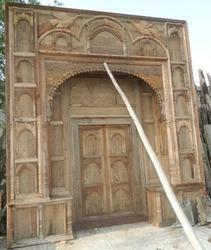 As a quality-oriented organization, we are focused to provide our clients excellent quality Old Carved Door. Old & unique pieces with utmost precision. In addition to this, our products undergo supervision of quality controllers in our experienced team, in order to ensure their flawlessness. Clients can avail the entire range from us, at market leading rates. 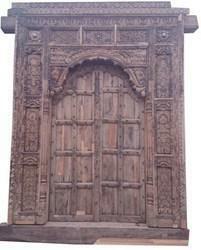 As a quality-oriented organization, we are focused to provide our clients excellent quality Vintage Carved Door. Vintage & unique pieces with utmost precision. In addition to this, our products undergo supervision of quality controllers in our experienced team, in order to ensure their flawlessness. Clients can avail the entire range from us, at market leading rates. We are well known industry in market as the foremost exporter and supplier of Vintage Exterior Color Door. It is one of a kind single piece to meet needs of our prestigious clients. Moreover, this door is highly acknowledged among our clients for its sturdiness, fine finish and durability. Clients can avail the entire range from us at industry leading rates. 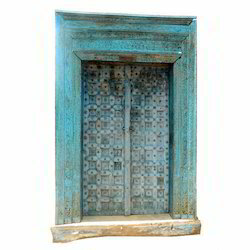 We offer a distinguished range of Vintage Carved Wooden Door in Turquoise color. The product are the original pieces and the strength of wood is enhanced by mother nature. In tune with different requirements of our copious clients, we customize the entire range in various sizes and shapes. 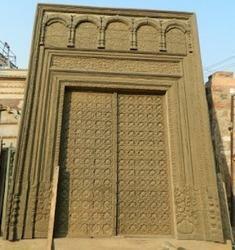 Front Door, A Vintage fine carved exterior door for heritages look to entrance. The door is restored to its provide sturdiness in the structure. 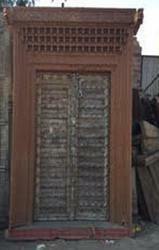 We offer a distinguished range of Vintage Carved Wooden Front Door. The product are the original pieces and the strength of wood is enhanced by mother nature. In tune with different requirements of our copious clients, we customize the entire range in various sizes and shapes. 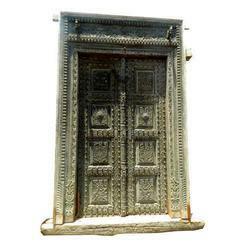 ALPA CORP architectural carved doors, front door, exterior door, vintage door, One of a kind Hand Carved Doors With Metal Fittings, Pillar Columns, Hand Carved Wooden Ceilings, Parinda Door, Door With Metal Fittings, Wooden Architectural Accessories and much more are offered in a way to align with home decor ideas. 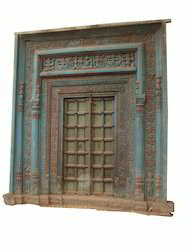 architectural door panels, vintage door, door sets, occasional decorative doors for interior design intricately carved door for residential and commercial spaces for theme decor. 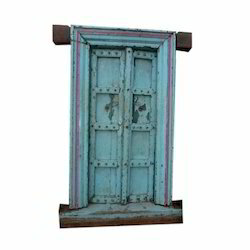 Being a well established-organization, we are engaged in exporting and supplying a distinguished range of Colorful Vintage Wooden Door with wax finish for antique theme decor. 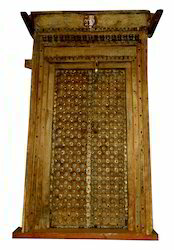 The antique doors are the original pieces and the strength of wood is enhanced by mother nature. 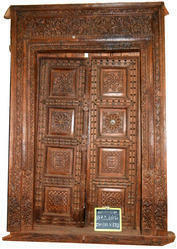 Door sets, doors with carved frame and door panels are available. In tune with different requirements of our copious clients, we customize the entire range in various sizes and shapes. For a current avaialability for vintage doors feel free to write. The Doors were made by skilled craftsman and the wood is treated naturally by Nature over years. Architectural Front door intricately carved at the doorstep adds a beauty and elegance to the residential and commercial sites. Fine hand craftsmanship from skilled artisans, salvage doors, vintage front, exterior and architectural doors provide a feel of olden and golden era. Solid wood doors in vintage designs and patterns reflecting Indian heritage look provides an elegance to interiors. 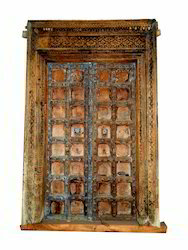 These solid wood door panels with carved border and metal fittings, some designs have carving on door panels etc. are made of old, reclaimed, salvage wood which is treated by nature over years. Perfect for entrance of resorts, hotels, clubs etc. 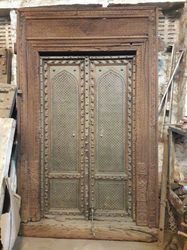 Architectural salvage Bakhra Carved Brass Fitted Door With Frame. 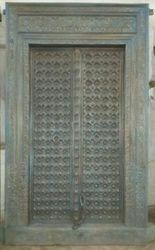 The doors are salvage pieces sourced from the relamation yards and are a result of urbanization and modern interiors. 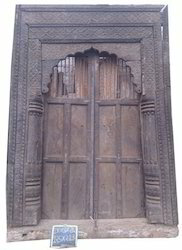 Architectural carved Heritage style Door With Carved Frame. 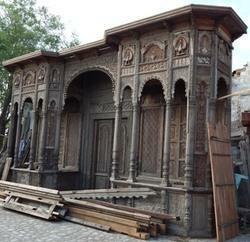 antique style carved front door, hand carved front doors, carved wood front doors, customized carved exterior doors. Architectural carved Solid wood doors in vintage designs and patterns reflecting Indian heritage look provides an elegance to interiors. 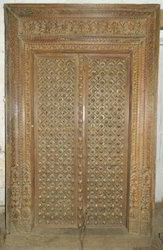 These solid wood door panels with carved border and metal fittings, some designs have carving on door panels etc. are made of old, reclaimed, salvage wood which is treated by nature over years. Fine hand craftsmanship from skilled artisans in front, exterior and architectural doors provide a feel of olden and golden era. with reference to the requirement of Commercial spaces, residential sites, we offer Architectural vintage reproduction styles. 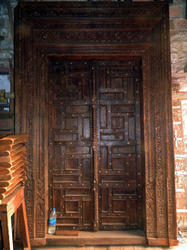 The Doors are finally finished to antique look to maintain the attraction of the piece. 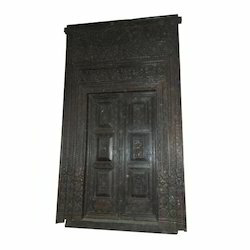 Looking for Antique Doors ?